It’s a routine I have – wander down to the library, return a few books, pay the inevitable fine, then wander round to the supermarket to pick up a few things for tea. At the pedestrian lights the mental anguish begins… Shall I just whizz across and have a look? Na, last time there was nothing but junk… But remember that navy horsehair bag for $1, and the yellow bag too! And that Festival of Britain scarf, I might even find some tools, or some scraps for the quilt, if I’m lucky some vintage patterns… The light turns green and I cross, succumbing to the draw of The Shop With No Name. 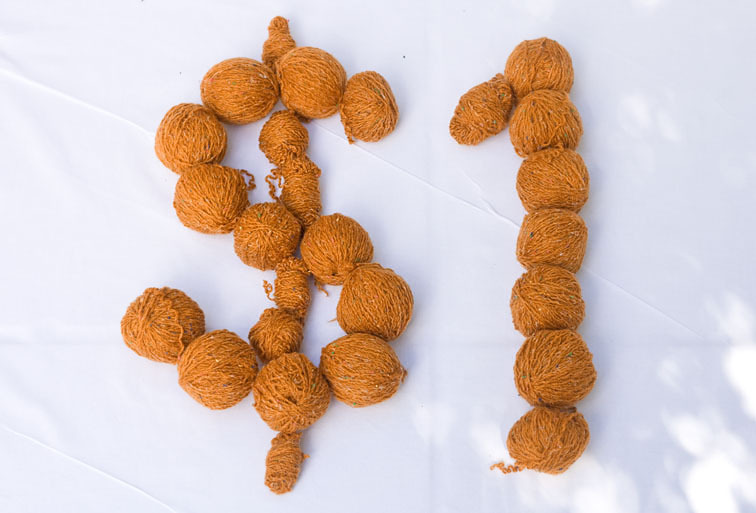 It’s in the $1 room that I usually find the best bargains, and a mustard woolly mass catches my eye. 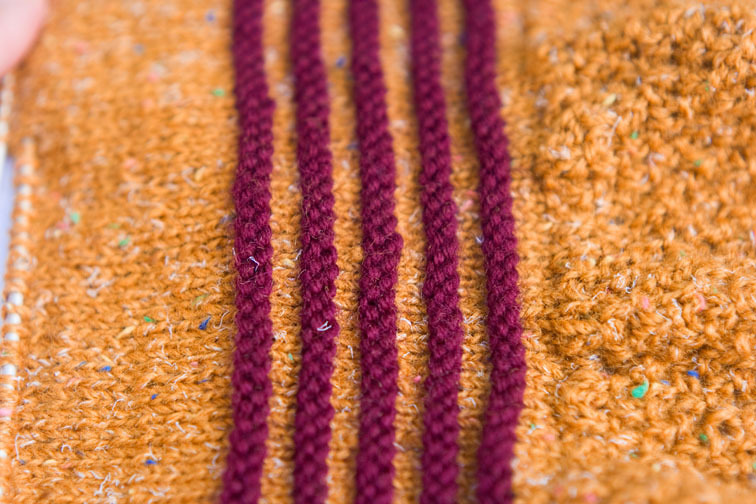 Eekyacht – it’s a gross old knitted cardigan! It’s huge but hey, it’s clean! Safe to touch, I inspect the inside – yes, it is hand sewn together – this handknitted grandpa cardigan is unravellable – yay! There is so much cardigan that my $1 purchase fills a grocery bag on it’s own. Over two sunny afternoons in the back garden, fending off the playful cat, I unravel the lovingly hand knitted grandpa cardigan. It has several tidily done repairs, and has even been taken in at some stage. I fantasise about who knitted it, and who wore it, and how many episodes of Coronation Street it took to complete. I don’t remember the recycling word being part of our vocabulary in those days. Reusing materials was what you did – you never threw out anything if it could be used for something else. Materials were usually good quality and discarding them would have been a waste – common sense really. It is good to see recycling become popular again – whether it is for environmental reasons, reasons of thrift, to obtain something totally unique, or just plain old common sense – it’s all good. Don’t ask – the plum stuff cost $14! Since I found this wool, I’ve picked up some French navy 10ply wool for a song too! 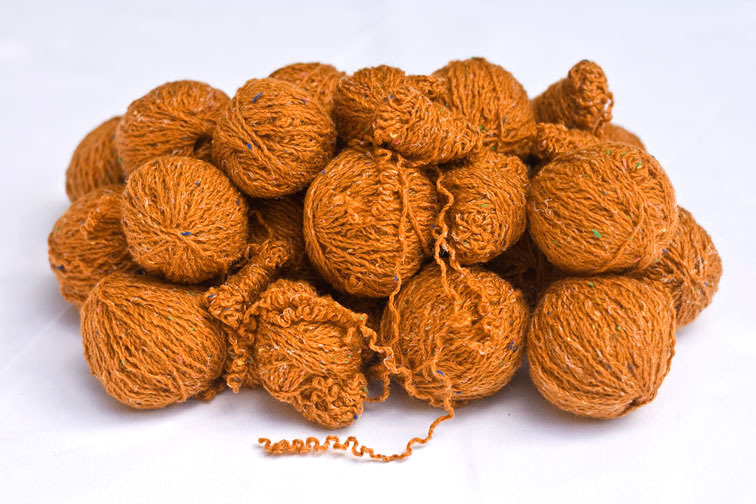 Have you unravelled any old jumpers just for the yarn? There are some real bargains out there for the intrepid yarn-hunter. You may not get your first choice of colour, but that would be too easy wouldn’t it?! And it can always be turned into a blanket like my Grandma’s…..
Trousers – Wide or Narrow Leg? Yes, I did, for sure. I realize that it's fun when there is no need to do it. For myself I think now: The war is a longtime over. I also used to turn inside out the cuffs of my father's and brother's shirts. That was my special task for holidays. So now I think it's enough! I have three thrifted sweaters in my deep freeze right now! This strategy is to kill any insect eggs they may harbor. Didn't want them particularly, since I already have three more in the queue to ravel, but my dear sweet husband sought them out for me — he was so proud to have found them. Don't want to discourage his newly developed scavenging instincts. I use them to supply my sock-knitting addiction. 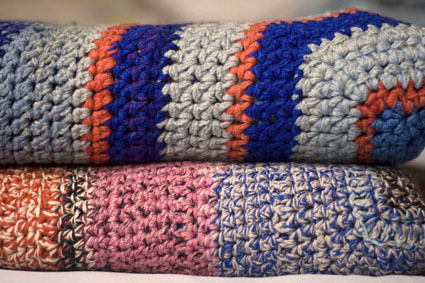 My mother and I also cut or tear woven scraps into strips to crochet rag rugs and hot pads; cut jersey knit scraps and old tee shirts into rag yarn to knit rag rugs. Your cardigan was an amazing find: extra-large sweaters can yield as many as five pairs of socks. What a great find!! The wool really looks nice too with it's flecks. I've not knitted seriously in many years, but I have done my share of unravelling finished garments – that I made! My mum would look at me in astonishment! I once unravelled an aran cardigan that had been my grandmothers – not sure my aunt was very impressed though…as she had knitted it originally! It did make a really nice jumper that I wore too many times to count. A tip from my grandmother to remove the kinks – wind the wool around a glass bottle full of warm water, and leave it for a bit. It works a treat. nope, I've never done it, but boy, I'm now have a whole new realm of possibilities for thrift shopping! thanks for that, I am already scheduling in some solid thrift store browsing/shopping time! I love that picture on top. I like spending time draping threads and flowers around for “still lifes”. My favorite kind of photo-taking ;). I still have never learned to properly knit. Must ask my mom to teach me how! Thanks for your comment, Marieke – don't be sorry! It is good to be reminded that things like this were a necessity for some of us at some stage of our lives. I keep forgetting to do this – I must be more diligent as I don't want moths! Thanks Chris I will try that! I washed it in hanks and hung it to dry with a weight, the kinks are softer but still there. What a terrific colour, and I'm glad you are finding a new use for it! 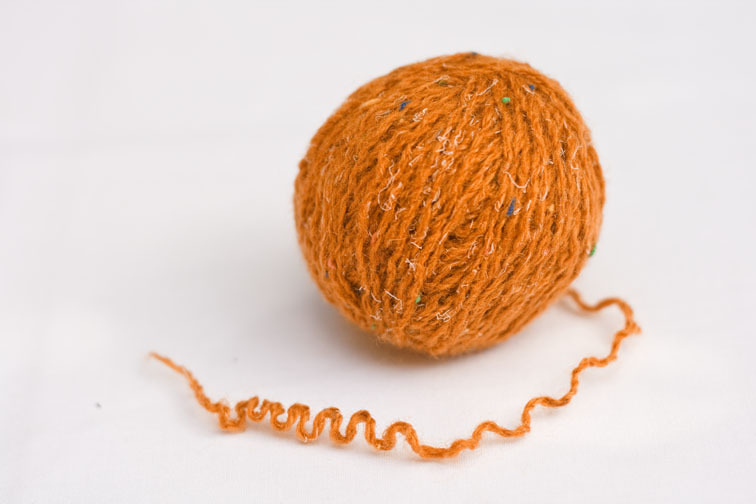 Nope, I've never unravelled anyone's knitting, except for my own, and only then in the case of a mistake! I thought I was the only person in the world who did this! I must admit to not having done it in years and probably only when it wasn't “trendy” and my Mum did it in the 70's when I was a kid. She used to buy woolen jerseys at the op shop and unpull and wash the wool to make us kids jumpers. I love the color! I know yellow and weird greens usually end up on the clearance rack, but the flecked yellow is pretty. It would also look nice with your coloring too, so bonus score. I've unravelled a few sweaters. Mostly my own knitted sweaters. You get to a point in your knitting where ripping out is no longer scary and to be avoided. Ripping out a thrifted sweater has yet to happen at my house though. I'll keep my eyes open for a suitable candidate. I've done this many times with good results. I even once unravelled a RTW jumper that was knit with a ribbony sort of yarn. I turned that into a neat little shrug that I knitted from a free pattern I found online. It's a great thing to do, but sadly there are less and less handknits in the op shops these days. I have just unraveled my first sweater – grey cashmere yarn for $2.99 🙂 I want to knit a throw. Hi Sherry, I've just discovered your blog. Sorry to come in so late to add my comment – I've unravelled jerseys and got the kinks out by threading the wool through the holes of a colander that was set over a pot of steaming water. Worked a treat! you just slowly wind up the wool as it passes through the colander. 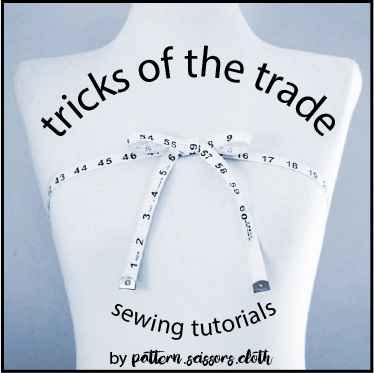 I admire your sewing and will remember to use the tutorials. Thanks!